Like the Sun King, Louis XIV is an aristocrat among other equals. Accented carvings add to this table's noble sense. Refined and sophisticated, Louis XIV makes any gameroom a unique and stately billiard room. A well-made, well-maintained pool table can last your family a lifetime. In fact, some of the most valuable tables available today were built before the Civil War. Since most people do not replace their tables every few years (unlike video games, home computers and automobiles), I usually advise them to be absolutely comfortable with their first table. 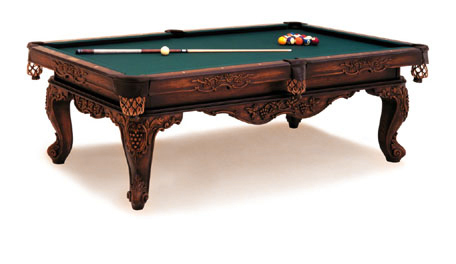 There are two primary aspects to a pool table: the play and the furniture. Generally you will see dramatic differences in the play of a table (how the balls roll, bounce, travel and react) on tables under $2500; smaller differences from $2500 to $3500; and very small differences over $3500. Starting around $3000 or so, we will then be paying more attention to the furniture aspects: style, finish, thickness and quality of the wood, etc. It is not even true that spending more money gives you better play. Some manufacturers cannot give you great play at any price. Some can do it for a very reasonable price. You just need to know what to look for. And why should you care? Because great playing tables are more fun! What affects the play? The cushions, the cloth, the slate and the rails: the things that the balls bounce off and travel over; plus the base frame that supports the slate. Technically, the most important of these is the rail. Ideally, the best rail would be solid concrete, twelve inches thick, and attached to a concrete floor. That would give us our best bounce; just as a ball bounces off a concrete building better than a wood building, which is in turn, better than a wood fence. Since we can’t pour concrete walls around every pool table, how do we approximate this? By using a slate bed on top of a very strong, rigid body frame. Yes, we know that most people think we use slate because it’s level and it doesn’t warp – but lots of things don’t warp. Plus, half inch slate is just as level as one inch slate. Why do we spend the money and work on slate that’s twice as thick? Because it’s twice as heavy!